October 2014 CCG announces award of contract to NHS-led bid UCP. September 2014 Interserve-led bid withdraws, three remaining bidders. Close of consideration of bids. Campaigners present remaining petition signatures immediately prior to contract award announcement. June-September 2014 CCG considers bids. GMB and UNITE publish allegations of Virgin connections to CCG members. Ongoing petitioncampaigning. Start date of contract put back to April 2015 in response to consultation concerns. June 2014 close of consultation with packed angry public meeting in Cambridge followed by demonstration. 5,000 petition signatures submitted. May 2014 CCS staff side meeting with bidders exposes lack of staff engagement from private bidders, first (and only) opportunity for private bidders to be questioned publicly. April-May 2014 consultation process, campaigners attend all meetings, challenge process, collect signatures and raise media profile of campaign. Growing public support for anti-privatisation stance. Healthwatch, Scrutiny Committee and local PPGs raise concerns, particularly about timetable. Detailed response submissions from Stop Sell-Off, UNISON and GMB/UNITE. March 2014 CCG announces four final bidders – Virgin, UCP (CUH/CPFT) and consortia led by Care UK and Interserve. CCS/United Health bid dropped. February 2014 CCG announces a consultation programme running from April to June. Timetable changed so that decision on contract will now be made in September 2014, after consultation period, rather than in May 2014 before any public consultation. Contract start date moved back to January 2015 (from June 2014). Question to Scrutiny Committee about robustness of process. January 2014 CCG hastily produces procurement and engagement strategies, as well as a much-redacted version of the procurement documentation. Legal victory claimed by campaigners and move to judicial review suspended. Lively Cambridge lobby of CCG attracts big media attention. December 2013 legal challenge by Leigh Day, initiated by UNISON and taken in name of Stop Sell-Off campaigners. Challenge on grounds of failure to consult, to produce documentation (ISOS), to publish procurement and engagement strategies. Appeal to raise £5,000 to cover potential legal costs quickly raises £3,000 with more promised. Letter before claim sent, prior to procedure to judicial review. November 2013 onwards – media interest raised as lobbies of CCG become bigger and more challenging. Capita withdraws from joint bid with Circle and CCS, who later submit joint bid with United Health. Serco withdraws from process. Five bids go into initial bidding process. October 2013 onwards – debate within Stop Sell-Off campaign about whether to focus on stopping process or supporting ‘NHS bid’. Broad agreement that contract is so flawed that priority should be to stop process altogether, whilst publicly campaigning to ‘stop privatisation’ as that is what public understands. September 2013 2,000 signatures against privatisation handed to CCG. PQQ stage of procurement, ten bidders express interest, including such private companies as Serco, Virgin, Interserve, Care UK. CCS linked to joint bid with Capita and Circle. CUH and CPFT submit joint NHS bid, linked to MITIE. August 2013 Stop the NHS Sell-Off launched on initiative of KONP, bringing together broad front of unions, political activists (including Labour Party), pensioners groups and individuals aimed at halting older people’s programme privatisation. July 2013 petition campaign stepped up at UNISON-sponsored ‘Big Event’ at Parker’s Piece. Start of regular lobbies of CCG meetings, questions asked about lack of consultation, evidence, patient involvement etc. Shadow Health Secretary Andy Burnham describes the Older People’s Programme proposals as “the most audacious sell-off to date”. 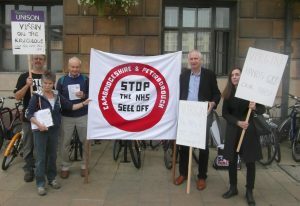 June 2013 Cambridge Keep Our NHS Public and GMB both start petition campaigns against privatisation of service (as well as MSK services, a proposal later withdrawn). Big response at Strawberry Fair. Lobby of CCG at Doddington Hospital where proposals were ratified despite misgivings from some board members. May 2013 CCG adopts recommendation of Older People’s Programme Board to set up an integrated programme for older people’s and adult community services, and put it out to procurement by open tender. April 2013 Cambridgeshire and Peterborough CCG ‘goes live’ after meeting in shadow form for previous months. CCG ‘Industry Day’ with 50 private companies invited to express interest in £1 billion worth of contracts – union warnings. 2012 CCS fails in bid to become Foundation Trust, which the government says all NHS organisations have to do by April 2014 (this is later amended to April 2015). 2012 Health and Social Care Act passed. April 2013 Section 75 takes effects, requiring services to be commissioned from ‘any qualified provider’.